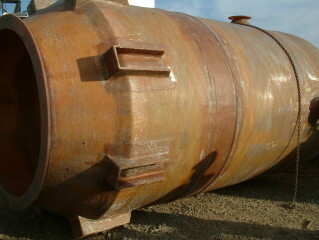 Storage tank, 4,500 gallon, fiberglass, 7'6" inside diameter on straight side x 15' high overall, domed top, unit is tapered in on the bottom for a flanged bottom piece (not furnished), flanged bottom inside diameter is 62"; from bottom of flange up 11'8" there are four 8" outlets at 12, 3, 6 and 9. 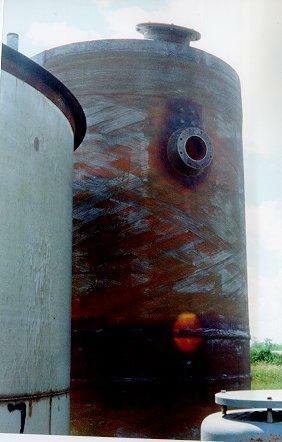 There are also some smaller 1" holes; on the top of the tank there are two 3" holes, one 16" hole, one 12" hole. 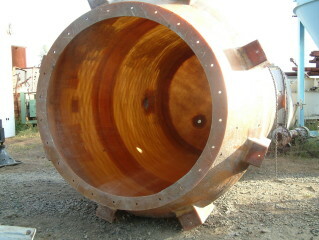 From bottom of flange, tank tapers for 2 ft. To the straight side; then straight side is 12' 7" high; overall 14'7".